Using the timeline created with documents from ‘Mountain Climber’ Brendan Duddy’s diary of ‘channel’ communications, official papers from the Thatcher Foundation Archive, excerpts from former Taoiseach Garrett Fitzgerald’s autobiography, David Beresford's Ten Men Dead, Padraig O’Malley’s book Biting at the Grave, and INLA: Deadly Divisions by Jack Holland and Henry McDonald, Danny Morrison’s published timelines, as well as first person accounts and the books of Richard O’Rawe and Gerry Adams, the fifty-five hours of secret negotiations between British Prime Minister Margaret Thatcher and Gerry Adams’ emerging IRA leadership group are examined day by day. In the run up to this period of communication, the IRA prisoners on protest issued a statement that made clear it would be acceptable to apply the demands they were seeking to all prisoners – in other words, the issue of special category status would be set aside or fudged. This broke the logjam; the impending death of hunger striker Joe McDonnell added urgency to communications seeking an end to the protest. The Adams Group consists primarily of Gerry Adams, Danny Morrison, and Martin McGuinness, and also includes Jim Gibney, Tom Hartley, and Ted Howell. This early morning conversation sets parameters for channel communication. First, it is clear the Adams Group is worried about the ICJP: “a great deal of confusion has arisen in Provisional circles from the impression given by the ICJP that there is every indication of movement by HMG”. Not only are the Adams Group concerned about the ICJP being facilitated in ending the hunger strike by the British, they were caught on the hop by the release of the statement from the prisoners that broke the logjam keeping a solution from being found. It ‘had been issued independently by the prisoners in the Maze and the timing came as a surprise to Senior Provisionals outside’. This is extremely important. The opening position of the Adams Group led the British to believe that if concessions on clothes, parcels and visits would immediately follow the ending of the Hunger Strike, the remaining demands could be worked out in the aftermath. The British offer in response met those conditions in good faith. Later, we will see the hunger strikers holding out for the ‘Five Demands’, completely unaware that their statement of the 4th had resulted in an offer that met the bulk of their demands – and that it was being repeatedly rejected in bad faith by the Adams Group on their behalf. Another important position communicated by the Adams Group to the British is that the ending of the first hunger strike was not an issue for them – they believed that the British were sincere. This effectively ends the lie about the British reneging on any offer made; a fiction that has been used since 2005 to justify the Adams Group rejection of Thatcher’s offers. 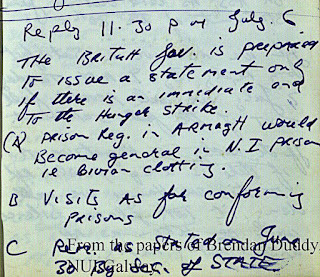 The British starting position – their offer to end the hunger strike – is substantial and has immediate implementation plans. By mid-morning on the 5th of July, it is clearly established that the Adams Group are keeping everyone else in the Provisional Movement leadership at all levels in the dark about the communication with the British. This was not an Army Council sanctioned initiative and in fact contradicts the Green Book on a number of points. It is also clear that the Adams Group are intent on attempting to neutralize the ICJP. The afternoon of the 5th is taken up with arrangements to send Danny Morrison into the prison to sound out the prisoners and report back with a further position for the British to work with. The British are clear that they cannot come up with a draft statement without knowing what the Adams Group's resulting position is first. The purpose of Morrison's visit, therefore, was meant to give the parameters of the offer to the prisoners in order to see if they would accept it. If the Adams Group then indicated that a settlement was indeed possible, the British would draft their statement. Morrison’s actual objective for the prison visit was not to find out what the prisoners wanted, but to make sure that the prisoners did not agree to anything the ICJP did. The ICJP were working on ending the strike, with similar proposals from the British that the hunger strikers would have accepted. They had the support of the Irish government and would have been able to stand as guarantors over any finalised deal agreed to. Morrison met with Bik McFarlane separately from the hunger strikers, and did inform him of the details of the channel offer; McFarlane would have needed to know the details of the offer the Adams Group were working on in order to combat anything the ICJP were proposing. Morrison makes sure Bik knows the line to push on the hunger strikers not to accept anything from the ICJP. While Morrison is at the prison, the channel discussions continued. The Adams Group is fully aware that the hunger strike would have to be called off first before any settlement was implemented, and had indicated this sequence of events would be acceptable. Morrison’s prison visit comes to an end after he phones Gerry Adams and tells him that the “prisoners will not take anything on trust, and prisoners want offers confirmed and seek to improve them”. Presumably Adams' response kept Morrison waiting for Bik McFarlane to return from instructing the hunger strikers to shun the ICJP. While waiting to regroup with McFarlane, he is ordered out of the prison. Someone at the NIO, no doubt made aware of Morrison’s visit to the prison, contacted IRSP Councillor Flynn – whose party represented the INLA hunger strikers – and instructed him to go to the prison as “there are developments”. Flynn and Seamus Ruddy met the NIO official who enabled Flynn to visit the INLA hunger strikers Kevin Lynch and Mickey Devine in the prison, after telling him that “there had been discussions between Sinn Fein and the government and that it looked like they might settle”. From what Lynch and Devine told Flynn, it was clear they were not given the details of what was on offer from the channel by Morrison. When Flynn confronted the Provisionals about the offer it was denied that they were involved in any secret talks. This may be because of who Flynn spoke to, as the knowledge of the talks was restricted to the Adams Group. It may also be, given the description in Holland & McDonald’s book, if it was someone in the Adams Group Flynn spoke to, the answer was Jesuitical – a denial they were “engaged in any secret talks with the NIO”. That much was true; they were in talks with Thatcher directly. McFarlane returns to his cell, and informs the PRO, Richard O’Rawe, of the offer from the channel. It is a fairly comprehensive offer. He later described it as “a huge opportunity” and believed “there [was] a potential here to end this.” O’Rawe and McFarlane agreed the offer was acceptable; McFarlane indicated that he would send a comm letting the leadership know. Crucially, this conversation has been confirmed by other prisoners on the wing who overheard it. The Army Council – Or Adams Alone? A further crucial point is that at the time, the prisoners – McFarlane, O’Rawe, and the general IRA population, believed that their comms were going to the IRA Army Council – that replies from the Adams Group were directives from the Army Council. The prisoners were under the impression that the channel talks were conducted with the full knowledge of the full council and according to the Green Book. 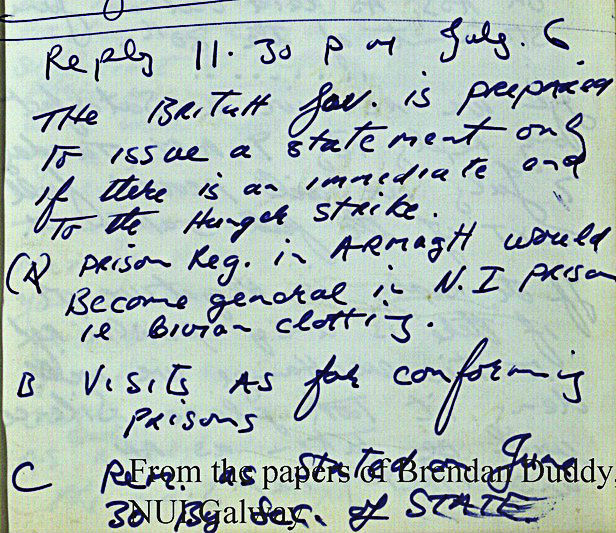 It may be that McFarlane understood the restricted nature of the channel talks and the directives coming in from the Adams Group but it is certain the rest of the prisoners, including the hunger strikers, did not know this, and viewed comms and directives from Gerry Adams as having the imprimatur of the Army Council. After the departure of Danny Morrison from the prison – where the hunger strikers and Bik McFarlane had been instructed to freeze out the Irish Commission on Justice and Peace – ICJP representatives Bishop O’Mahony, Father Crilly, and Hugh Logue visited the hunger strikers. The hunger strikers followed Morrison’s instructions, and their discussion with the ICJP revolved around mediators and guarantees, and emphasised that McFarlane, and what they believed was the Army Council, the Adams Group, would have to be consulted before they agreed to anything. They insisted that they had to hear any offer from the British themselves – but the main point was that even if anything was acceptable to them, they would have to “square any settlement” with McFarlane. Far from the hunger strikers and prisoners being in control of their destiny, and the IRA structure following their wishes, the prisoners were subjugated to the control of the Adams Group – who were using the authority of the Army Council without sanction to impose their will. Nevertheless, the commissioners left in a hopeful state. Before they left, Kieran Doherty spoke briefly in Gaelic to Oliver Crilly. Doherty, Crilly told Logue, had told him that if somebody came in and read the terms out to the hunger strikers, they would accept them. The contrast between the two men's responses shows the desperate gulf: Doherty seems to have realised the worth of the ICJP initiative. McFarlane, as a good soldier following the instructions given via Morrison's visit, in his behaviour towards the ICJP demonstrated that he was intent on cutting them out from “the business of trying to get a solution”. The hunger strikers themselves – if only they were told the terms of what was on offer – would accept one. The channel discussions resumed upon Morrison’s return from his visit to the prison, and the report he delivered was “alarming”: “the situation was now so bad the possibility of any settlement was seriously in doubt”. The Adams Group informed the British that the prisoners were completely hostile to the ICJP. Duddy was met with anger and abuse – most likely a show designed to get the British to stop their concurrent discussions with the ICJP. Morrison must have sensed the hunger strikers were close to accepting what the ICJP were proposing, and this panicked the Adams Group. Their strategy was to tell the British that they were too upset by the “Bully Boy” tactics of the ICJP to give them their response. The British had been waiting on the response from Morrison’s visit to the prison in order to complete their draft statement. This temper tantrum by the Adams Group was nothing but a tactic to keep the British and the hunger strikers from ending their protest on the ICJP’s initiative. In other words, if the British go behind the Adams Group's back, either via the ICJP or some other means of communicating with the prisoners, the Adams Group would veto any such agreement. Kept in the dark and denied the ability to agree to any offer, the prisoners clearly were not in control of their protest. When they confronted Alison about the secret talks, however, he was so obviously astonished that the ICJP were convinced ‘that he didn't know the second line of contact’ was opened and was ‘as much in the dark’ as the ICJP had been. [T]he only people [Jackson] could say knew for sure about the Mountain Climber initiative at that point were himself, McFarlane, block OCs Pat McGeown and Sid Walsh and the PRO Richard O'Rawe, and the hunger striker, Joe McDonnell. As for the rest, [Jackson] says, it would have been on "a need to know basis": the closer a hunger striker got to dying the more likely he was to know. Mickey Devine and Kevin Lynch, the INLA members, wouldn't have been informed, one way or the other, nor would the hunger strikers who were still on the blocks. The rest of the ICJP's afternoon and evening were spent pushing Alison on their proposal to end the strike, and they secured an agreement that the NIO ‘would see the prisoners with the governor by mid-morning the following day, Tuesday’. This position is in keeping with Brendan Duddy's assessment of the Adams Group position articulated through the channel throughout Sunday. Was Atkins reporting the detail of the channel communications, or was someone else from, or close to, the Adams Group talking to someone from the NIO? However, according to statements he made to author Padraig O'Malley published in 1990, Atkins appears to be yet another person who at the time was completely in the dark about the secret talks. Atkins does make clear to O'Malley that 'any contact with HMG' would not have been under his control – so it is unlikely he would have been privy to the full details of the secret talks. This makes his knowledge of the detail of the Adams Group position more intriguing, and may also account for his recommending 'standing firm' as the preferred course of action in the minute report. As it was, Thatcher was already pursuing an alternative suggestion of his, which was to use a combination of the ICJP and direct, "channel" negotiations with the PIRA as represented by the Adams' Group. Atkins' observation that the views of the Provisional leadership – the Adams Group – were “important” because “they seem to be largely in control of the strikers” shows an awareness by the British that the prisoners themselves were not in control of their protest. He is also aware that the Adams Group “regard the ICJP as an intrusion' and would “be looking for a way of claiming a “victory””. While Atkins' recommendation to Thatcher is to stand firm, he is keenly aware that such a stance would be counterproductive to their own longer-term self interests. If they took the course of standing firm, it would only end up “discouraging the Provisionals from switching from terrorist to political activity at the very moment when we know that they have begun to find political action attractive ”. The British end of the channel, meanwhile, was working on the draft statement. 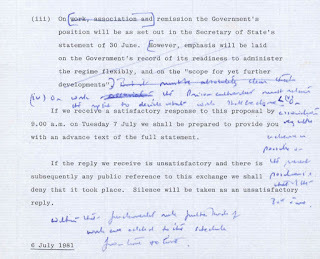 Thatcher's input, handwritten on the British copy, informed the statement that went down the channel as a reply to the Adams Group at 11:30 that night. The Adams Group wanted to be sure they weren't going to be undermined by the ICJP. Morrison, according to Fitzgerald, phoned requesting a meeting with the ICJP. Despite their refusal, the Adams Group's determination to keep abreast of the ICJP's diplomacy meant he arrived at their hotel anyway. 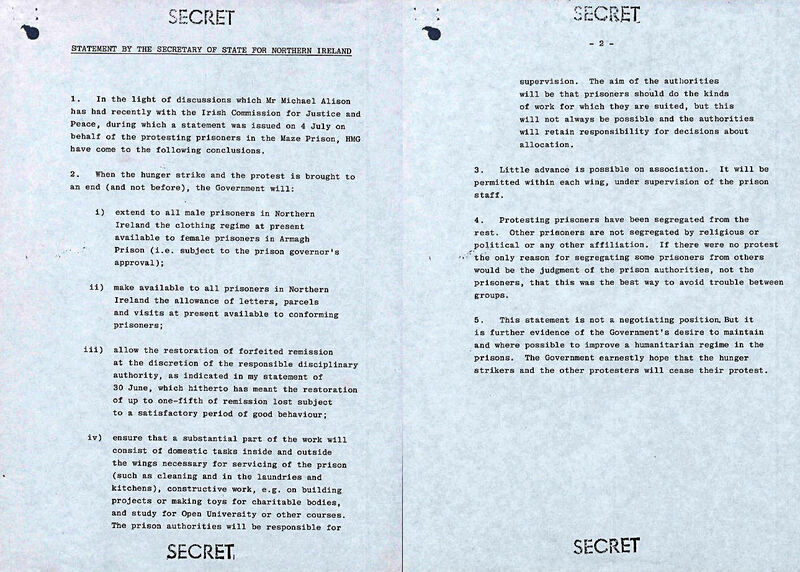 The Adams Group's own “contacts with the British were continuing through the night”, Morrison is reported to have told them, and “he needed to see the actual commission proposals”. The ICJP gave him a run-down of their discussions with Alison, which included the ‘general gist’ of the proposals between them and the NIO. They also inform Morrison ‘that a guarantor will go in at 9am the following morning, Tuesday, 7 July’. The morning deadline – given in the British offer and confirmed by Morrison's double checking the ICJP’s arrangement with the NIO – sets the agenda for the next hours to come. The Adams Group spent a considerable amount of the time the previous two days attempting to derail the ICJP effort. They had thrown a wobbler over the ICJP to the British, instructed the prisoners to freeze the ICJP out, and told the ICJP in no uncertain terms to back off after letting them know that they were in their own, more senior, talks with the British themselves. The effect of telling the ICJP about their own secret talks was a spanner in the works, meant to slow things down. Certainly the ICJP reaction to the news meant their afternoon and evening were taken up with stunned confrontations and clarifications - valuable time wasted. After getting the 'general gist' of the proposals the ICJP were given, the Adams Group prepared their response to Thatcher's 11:30pm statement. Their reply, sent at 3:30am, backtracked on what they had previously indicated, and echoed the comm sent in to the prisoners Monday afternoon. Previously, their position had been that 'demands dealing with work and association could be subject to a series of discussions after the ending of the hunger strike'. To assist us in taking a ?(firm)? decision on your proposals, elaboration on Point C – Remission, Point D – Work, Point E – Association is necessary. These are obviously the major points of contention which need to be resolved if the prison protests are to be permanently ended. The position outlined by you is not sufficient to achieve this. On Work, the Adams Group wanted emphasis on 'Self education'. For Association, “We believe there should be wing visits”. Full remission continued to be pushed for. They wanted fuller detail put into the statement before agreeing to agree: “We and the prisoners need an outline of the specific improvements envisaged by you. We also require your attitude to the detailed proposals outlined by the prisoners”. Asking at 3:30 in the morning for more detail, and pressing for clarification to happen before the sequence they had already agreed to, meant it would be impossible for anyone from the NIO to come in to speak with the prisoners at 9am, as the ICJP had thought they arranged. By 11:40am, the ICJP, unaware that their agreement with the NIO was being thrown off course by the secret Adams-Thatcher talks, begged Alison to send the official in to the prisoners as promised. Alison, constrained by the channel discussions, could only stall for time, and promised the official would go in later in the afternoon. The NIO was unable to conclude anything with the ICJP as the secret talks between Thatcher and the Adams Group were ongoing. Gerry Adams and Danny Morrison also met again with members of the ICJP, according to Garrett Fitzgerald. Were the Adams Group working towards achieving more than the ICJP, or were they working on delaying any settlement? Either way, as David Beresford in Ten Men Dead put it, “they desperately needed to get the commission out of the way”. Humphrey Atkins continued to argue his position of standing firm with Thatcher, although like his earlier advice, Thatcher did not take it. Given what is evident in the record of channel communication, she believed if a settlement were to be achieved, and the hunger strike brought to an end, the opportunity lay with the Adams Group talks; standing firm in private with them would achieve nothing. As Adams described her in his autobiography Before the Dawn, “she was no stranger to expediency”. Thatcher's response to the Adams Group's rejection simultaneously gave the Adams Group what they wanted - the demise of the ICJP initiative - while at the same time appeared to close the channel. Adams and Morrison's revelations to the ICJP had indeed been a spanner thrown into the works on a number of levels. Not only that, their response to the British offer was seen as a rejection and the British were appalled. 2. Position of June went to the limits that we could do in our P????? 3. By suggesting that we do more, the SS [Adams Group] are inviting us to abandon our principles. Their response amounts to a rejection. We are appalled by this decision. Our discussions with CJ have come to an end and they will have no further parts in our efforts to resolve the problem. We are also deeply disturbed as we were told in June by the SS abuse of knowledge of the channel. C Jenkins as pre(vious??)=Krugs??? Has clearly been told of its existence and involved to activate it. C Jenkins Union put it ?the? Mr A last night that this was a possibility open to many in a room full of people. This must be in question, the future of the channels. In keeping with the workplace code, where the Adams Group were the Shop Stewards, the prisoners the Union Membership and so on, the ICJP was aptly named as a competitor to Adams Group's Shop Stewards, seeking to represent the prisoners. Their code name was the 'C Jenkins Union'. The British did not appreciate that the ICJP had been told of the existence of the secret talks and were less than pleased that the ICJP had then confronted Alison about them 'in a room full of people'. The ICJP initiative was now dead in the water. While the British were appalled by the rejection of their offer, the Adams Group does appear to have achieved their primary objective of sidelining the ICJP, and, remarkably, received an apology from the British. Both Adams and Morrison's tantrums over the involvement of the ICJP and the breach of the confidentiality of their talks with Thatcher were effective. Even better for the Adams Group, they now had a scapegoat to blame for the breakdown of any possible deal that would have delivered a settlement, and for explaining the prolonging of the hunger strike. The secrecy of their talks with Thatcher gave cover to both the British and the Adams Group, for reasons beneficial to each own's agendas of self interest. By 4pm the ICJP were still waiting for the NIO official to come to speak to the prisoners. They were told 'the official would be going in, but the document was still being drafted.' Padraig O'Malley writes that “David Wyatt, a senior NIO official who had sat in on most of the discussions, rang to explain the delay: a lot of redrafting was going on and it had to be cleared with London”. At 6pm the ICJP contacted Alison again with concern; the Dublin government was also putting pressure on London to send someone in, to no avail. The prisoners would have been expecting the NIO to send an official in regarding the ICJP initiative that morning. They had been told by Adams that "more was needed" from the channel talks. They most likely did not know that it was those channel talks causing the delay; they definitely did not know that Thatcher was working on a draft that would have been acceptable to them. [A]s it became clear [the ICJP] were making progress, we were led to believe by everyone except those most closely involved that a settlement was imminent. Even the Deputy Secretary of State Michael Alison indicated that the hunger strike was about to be resolved and that he would be sending in a message to wrap the whole thing up. This was the feedback most of us were getting at the time. By 7pm the Adams Group sent the first of two responses to Thatcher. She had extended an apology for 'any false impression' given by the ICJP's initiative and taken the ICJP off the scene in response to the Adams Group's complaints, and the breach of the confidentiality of the secret talks. The Adams Group, however, pressed on. It wasn't the fault of the ICJP after all - it was the fault of the British: “If false impressions are given, they are contained in the very parameters set down by you”. The threat of closing off the channel discussions completely had upset them. Does your last communication mean that you are breaking with the original criteria you set or do you wish to continue? Joe McDonnell is pledged to die unless he achieves the conditions required by the prisoners for a settlement. Less than an hour later, a second, follow-up message was sent through the channel to Thatcher. We are fully aware of Joe McDonnell’s position and his commitment to the prison demands. We have stressed this on many occasions. We cannot and will not intervene in the Hunger Strikes unless satisfied are met to their collective satisfaction. The Adams Group were content to use Joe McDonnell's commitment and the facade of the prisoners being in control as leverage - although the prisoners knew little to nothing of what was being done in their name, if they had any idea at all. The Adams Group's 3:30am rejection had been based on Remission, Work and Association; they were holding out for full remission, an emphasis on self-education, and wing visits. After hiding behind the condition and commitment of Joe McDonnell and the prisoners, they ended their evening communication settling for a 're-phrasing of D [Work] & E [Association]'. 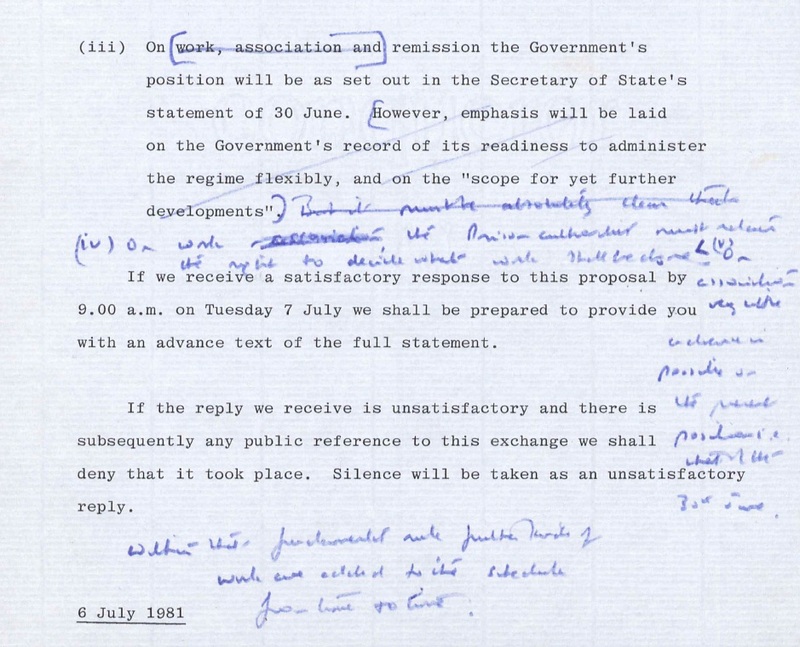 The second communication asking for the rephrasing of Thatcher's offer had been sent at 7:50pm. Immediately after sending off that message, according to Garrett Fitzgerald, at 8:30pm Danny Morrison and another person arrived without notice at the ICJP's hotel, and 'their attitude was threatening'. Morrison also demanded that the ICJP keep him informed of what they were doing, but the ICJP refused to cooperate. They viewed his visit as an 'onslaught'. While Morrison was threatening the ICJP, the British were debating the draft settlement they were preparing to send. Earlier, Humphrey Atkins had sent a draft statement that retained a firm line. This was not the position Thatcher decided on going with, however; she continued to revise the offer sent down the channel at 11:30pm the previous evening. If the Adams Group accepted the offer and ordered the hunger strikers to end the protest, 'the statement would be issued immediately'. Otherwise, the British would revert back to their position of June 30th and their discussions with the ICJP. And if the Adams Group leaked anything about their secret talks again, the British would deny everything. The British believed that their revised statement 'would be enough to get the PIRA to instruct the prisoners to call off the hunger strike' and had prepared the procedures that would follow once they did. 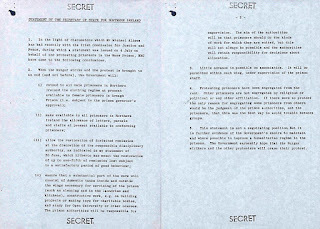 Thatcher personally approved it all, the statement and the sequence, and directed the offer to be sent to the Adams Group. The ICJP had no idea the extent of which they'd been sidelined, and continued to press Alison to send an official in to the prisoners. At 9pm Alison told the ICJP that someone would be going in shortly. 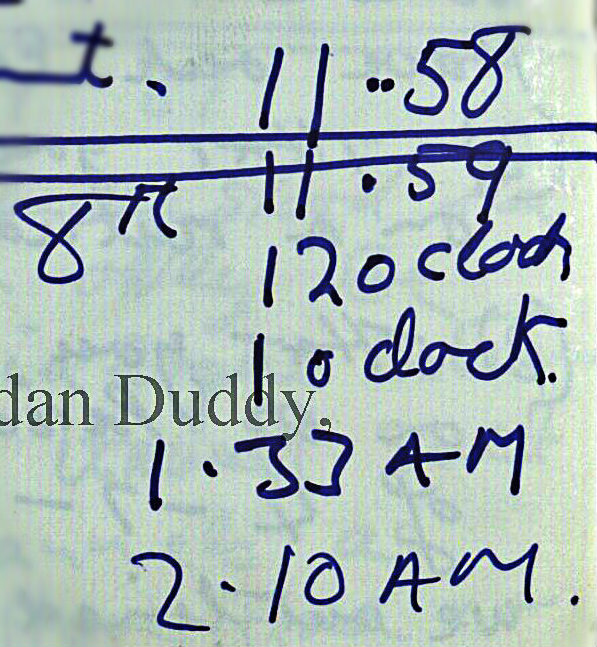 Both Morrison's timeline, which is based upon Ten Men Dead, and Garret Fitzgerald agree that by 10pm, Alison contacted the ICJP to tell them no one would be coming in that night after all, but that between 7 and 8 in the morning, an official would go in, and 'this delay would be to the prisoners’ benefit'. Tellingly, when Alison was asked by the ICJP why no one had gone in yet, 'Alison replied, “Frankly, I was not a sufficient plenipotentiary.”'. Thatcher's authority obviously superseded the NIO's and her secret talks with Adams rendered the NIO-ICJP initiative pointless. Gerry Adams decided he needed some rest. He explains in Before the Dawn that he 'started cat-napping during the day in order to be relatively fresh for negotiations at night'. Ten Men Dead details that Adams 'had taken a break Tuesday evening' and did not return to the safe house where the channel communications were conducted until 'the early hours of the morning'. According to Danny Morrison, at this point "Republican monitors [were] still waiting confirmation from Mountain Climber," and he claims that "[t]he call does not come." This is repeated in Ten Men Dead, where a member of the Adams Group in the safe house tells Adams upon his return from his cat-nap that nothing has come through. The impression is that the channel line had gone dead and the British were done with the communications. These times are then followed in the diary by the details of the offer made by Thatcher that could have ended the hunger strike. It is unlikely that those times are a record of attempts made by the Adams Group to contact Thatcher, given they were waiting for her response to their 8pm messages, and Adams was not available. Could it be that the list is an accounting of the amount of times Duddy had attempted to contact the Adams Group with Thatcher's offer before Adams returned from his nap? The choreography was in place. Everything the Adams Group had asked for was there, such as the rephrasing on Work and Association. They were even given their added demand of the veto of sight before the prisoners were to be given the agreed statement and it was released publicly. All that was needed was for the Adams Group to say it was enough to end the strike, and the process of saving the men's lives would begin. [British] The management will ensure that as substantial part of the work will consist of domestic tasks inside and outside the wings necessary for servicing the prisoners, such as cleaning and in the laundry and kitchen, construction work for example on building projects or making toys for charitable bodies and studying for Open University or other courses. The factory authority will be responsible for supervision. The aim of the authority will be that prisoners should do the kind of work for which they are suited. But this will not always be possible and the authorities will retain responsibility for decisions. It (Association) will be permitted within each wing under supervision of factory staff. In the light of discussions which Mr Michael Alison has had recently with the Irish Commission for Justice and Peace, during which a statement was issued on 4 July on behalf of the protesting prisoners in the Maze Prison, HMG have come to the following conclusions. ensure that a substantial part of the work will consist of domestic tasks inside and outside the wings necessary for servicing of the prison (such as cleaning and in the laundries and kitchens), constructive work, e.g. on building projects or making toys for charitable bodies, and study for Open University or other courses. The prison authorities will be responsible for supervision. The aim of the authorities will be that prisoners should do the kinds of work for which they are suited, but this will not always be possible and the authorities will retain responsibility for decisions about allocation. Little advance is possible on association. It will be permitted within each wing, under supervision of the prison staff. Protesting prisoners have been segregated from the rest. Other prisoners are not segregated by religious or any other affiliation. If there were no protest the only reason for segregating some prisoners from others would be the judgment of the prison authorities, not the prisoners, that this was the best way to avoid trouble between groups. This statement is not a negotiating position. But it is further evidence of the Government’s desire to maintain and where possible to improve a humanitarian regime in the prisons. The Government earnestly hopes that the hunger strikers and the other protesters will cease their protest. It would be two hours until the Adams Group came back with any answer, and it was not the one anyone had hoped for. At 4am in the morning, the Adams Group send their first response to Thatcher's latest offer through the channel. A request is made for Adams to go into the prison. The purpose is listed as '1. To ensure success 2. 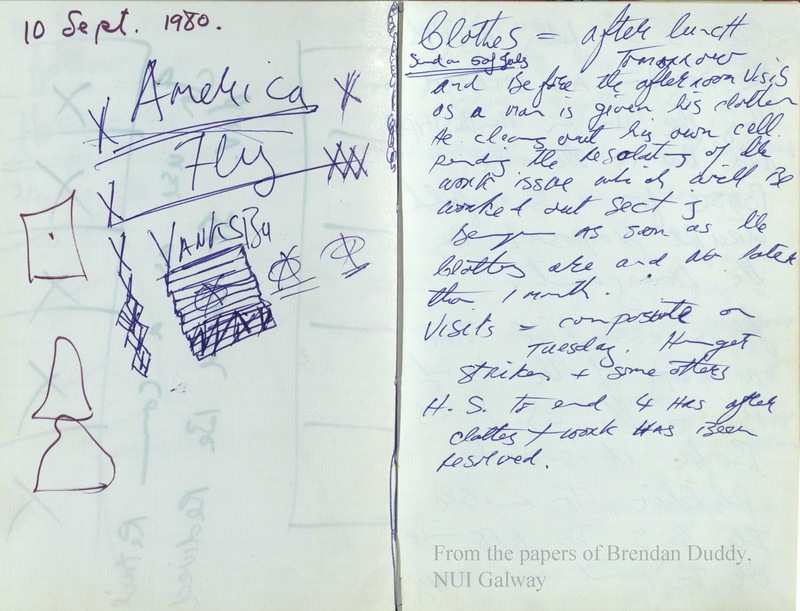 To achieve' — the notation in the diary is brief and vague, but asking for Adams to go in at that point — knowing the British had repeatedly rejected him when he was previously suggested was a bold request. Was it really necessary for Adams personally to go in for the strike to end? Would that be something worth rejecting the offer over? At 5am, the Adams Group sends a further new demand through the channel. In addition to the public document that Thatcher has drafted, they now want a private document to be drawn up as well. This private document, they demand, should be a 'detailed nitty-gritty' of work, association, and the rest of the prisoners' demands. They had already agreed that these details would be worked out after the hunger strike was called off. Now, at the exact moment while in the prison hospital Joe McDonnell's sister Maura was shaking his still-warm body crying for him to not be dead, the Adams Group demanded even more upfront before they would consider ordering an end to the strike. The British response to the new demands was not long in coming. The communication on the channel was over. The management cannot contemplate the proposal for two documents set out in your last communication and now therefore the exchange on this channel to be ended. At the last minute, acting in bad faith, the Adams Group demanded too much. Danny Morrison gives the time of Joe McDonnell's death as 4:50am; that is when Father Murphy woke up Joe's family, who were sleeping in the prison hospital, to tell them he had died, and his sister Maura, shouting and shaking him, desperately tried to bring him back. Word confirming his death was slow in getting out, and somewhat confused. 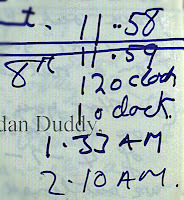 Duddy's diary puts Joe's death 17 minutes later, at 5:07, though it was not known he had died until the morning news broadcast; the Bobby Sands Trust as well as various other websites including the Sinn Fein bookshop, list his death at 5:11am; Padraig O'Malley writes that Joe died at 5:40am. The Adams Group and the British, unaware he had died, were in discussions until 5:30am, and did not hear of his death immediately; it was a number of hours before they knew: "We first heard it on the 7:00am news," Duddy records. Adams' autobiography confirms they did not know Joe had died while they were conducting the channel discussions: "Then, later, when we turned on the first news broadcast of the morning, we heard that Joe McDonnell was dead." Without divulging that at the time Joe was dying he was inserting another new demand into the process of settlement, Adams lets his readers believe the reason the British had ended their communication was because they had been informed of Joe's death. But the times noted in Duddy's diary, combined with the Adams Group's new demand and the British reaction, make this impossible. It was not Joe's death that caused the British to end the channel discussion; it was the new, bad faith demand for more detailed documentation; details that the British believed had already been agreed could be worked out once the men had come off their strike, in order to save their lives. By 6:30am the NIO finally sent in an official to read a statement of the British position to the prisoners. As promised, given the rejection by the Adams Group of Thatcher's offer, the statement was absent of any indication of the strides made in either the ICJP or Adams Group discussions. 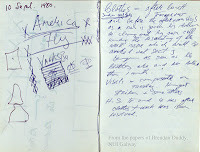 According to Garrett Fitzgerald, Adams contacted the ICJP fifteen minutes after the NIO went into the prison, and immediately blamed the British. He 'rang the commission to say that at 5:30am the contact with London had been terminated without explanation'. When we heard the news of Joe McDonnell’s death and of the last-minute hardening of the British position, we were shattered. We had been quite unprepared for this volte-face, for we, of course, had known nothing whatever of the disastrous British approach to Adams and Morrison. Nor had we known of the IRA’s attempts – regardless of the threat this posed to the lives of the prisoners, and especially to that of Joe McDonnell – to raise the ante by seeking concessions beyond what the prisoners had said they could accept. "Don't you worry about Joe McDonnell," he said to Bik McFarlane in the canteen after Danny Morrison's Sunday visit. It was the first time Bik and Joe had ever met each other. Joe was 'confined to a wheelchair', his 'head crouched low to one side', and he 'could barely hear' what was said. He was in 'an appalling condition'. Yet he shook Bik's hand despite immense pain. "I might only last a few days but I'll hang on as long as I can and buy all the time we need."